A majority of Northerners supported the Union war effort, yet a sizable and vocal minority opposed the conflict. Most of the opponents, the Copperheads, preferred a peaceful resolution to the war, with some of these people even calling on the North simply to leave the seceded Confederate states alone. During the American Civil War, people who opposed Northern attempts to subdue the South militarily usually referred to themselves as Peace Democrats, while their opponents nicknamed them Copperheads after the venomous snake. Burnside hoped to silence war opponents, including Vallandigham, with this order. While the order stated that deportation of Copperheads to the Confederate States of America was the most likely punishment, Burnside commented that death might be a suitable punishment in extreme cases of disloyalty. Seeking additional supporters for their cause, Peace Democrats continued to hold rallies in Ohio. One such rally occurred on May 1, 1863 in Mount Vernon, Ohio. At this gathering, Ohio’s leading Peace Democrats, including Vallandigham, urged attendees to denounce the Union war effort and to protest against General Order No. 38. In reference to the order, Vallandigham purportedly stated that he "despised it, spit upon it, trampled it under his feet." At least two Union officers attended the rally, and they quickly informed General Burnside of Vallandigham’s statements. Burnside immediately dispatched soldiers to arrest the Copperhead. The men apprehended Vallandigham in Dayton, Ohio, this Peace Democrat’s home city. Authorities transported him to Cincinnati, Ohio, where Burnside’s headquarters was located and where Vallandigham would stand trial before a military tribunal. Throughout the trial, the Peace Democrat and his attorney, George Pugh, never denied that Vallandigham had violated General Order No. 38. Instead, the two men claimed that the military tribunal did not have jurisdiction in this case. 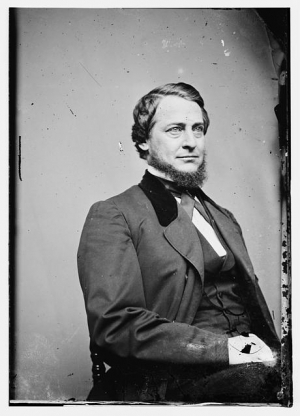 The military court rejected the defendant’s arguments, finding Vallandigham guilty and sentencing him to federal prison until the Civil War’s conclusion. Vallandigham attempted to appeal the ruling in United States Circuit Court, but the presiding judge, Humphrey Leavitt, ruled in favor of the military, stating that, during times of war and civil unrest, that the federal government could legally expand its powers to ensure victory. Fortunately for Vallandigham, President Abraham Lincoln commuted the Peace Democrat’s sentence. Rather than imprisoning Vallandigham, Lincoln ordered him to live in exile in the Confederacy. Military authorities escorted Vallandigham to Confederate lines on May 25, 1863, carrying out President Lincoln’s decision. Vallandigham only remained in the Confederate States of America for a short time period, moving to Canada in June 1863. In Canada, Vallandigham ran for election as Ohio’s governor, but he was easily defeated by Unionist Party candidate John Brough. In violation of his punishment, Vallandigham returned to the North, settling in Ohio, in early 1864. Upon returning to Ohio, Vallandigham became the supreme commander of the Order of American Knights, which was also known as the Sons of Liberty. The Sons of Liberty were a more radical group of Peace Democrats. They sought to hamper the Northern war effort by any means possible, including utilizing violence. Ohio officials claimed that as many as one hundred thousand Peace Democrats belonged to this organization in Ohio alone, but most scholars believe that authorities greatly exaggerated the actual number. One Sons of Liberty plot involved freeing Southern inmates at the Union’s Johnson’s Island prison camp on Lake Erie. Sons of Liberty members hoped to capture the Michigan, a Northern gunboat operating on Lake Erie near Sandusky, Ohio. Using the ship, the plotters intended to sail to Johnson’s Island and to rescue the Southern prisoners of war. These now released prisoners were to become the basis of a new Confederate army that would operate on Northern soil. Union spies infiltrated the Sons of Liberty, alerting Northern authorities to the plot. Officials arrested Charles Cole, the ringleader, before he could put his plot in motion. While most Northerners supported the Union war effort, Copperheads were a sizable and a vocal minority. Their actions prompted much concern among Northern officials during the war’s first years. By late 1864 however, Union military victories and the nearing end of the conflict caused most Northerners to rally behind President Lincoln and the Northern war effort. The more violent actions of radical Copperheads, including the Sons of Liberty, also caused Peace Democrats increasingly to unite with the federal government.